I've always dreamed of being faster than an arrow and quicker than lightning. I never thought my dream would become true until the day I mounted Arrow... for about 8 seconds. My neighborhood was fairly suburban with a 4-foot space between houses. The only animal that anyone thought to keep was a dog or the occasional cat. Although, if you dared to venture further into the small houses and tiny yards you might see a field and fences, and horses. One steaming summer day, me and my sister rode down the perfectly paved road all the way to the land of horses. I dismounted my orange bike throwing off to the side and into the tall grass. The grass whispered as I made my way through it. A tall brown horse was waiting for me. The horse was about 15 hands high and was feed and watered but was not cared for the way a horse should. The horse mane was full of burrs and its fur was matted in more than one area. "I want to name him Jasper!" My sister announced. I jerk and startled the horse in front of me. "Jasper. Are you kidding me?" I asked. "Nope, but that light brown one looks like Dominique." "Fine then that one is Johnny." "You're catching on." My sister, Jessica had an unmistakable twinkle in her eyes. "No, no, no, no. Uh-uh. Horses are pretty and deserve pretty names, but for your sake Dominique and Jasper will remain the same, but Bob is now Arrow." 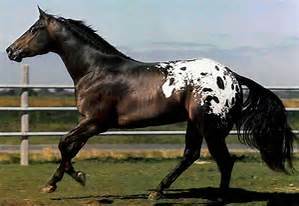 I said pointing the black and white horse which later I found out was an appaloosa. "Agreed. Motion carried." Jessica grinned from ear to ear. I walked further down. I wanted to be way farther out of the houses view point. "So, do you want to ride one?" I asked. "Are you kidding? That's-that's like illegal, Rae." Jessica hissed. "I don’t see a no trespassing sign. Do you?" I replied. "Alright fine, but if we get in trouble I’m Jill and you are Joan." "Whatever makes you happy." I said hoisting myself over the fence. "You’ve ridden horses before, right?" I asked Jessica. "Course! You’re so oblivious. Well I did ride them until Mama said the lessons were too expensive." Jessica looked down cast. I was willing to do just about anything to make her happy, "Here’s your shot, make it count." I took her arm and lead her to the previously named horse, Arrow. "Can do something to make it stop moving?" Jessica implored. I ripped up a handful of grass and held it up for the gelding to eat. "I still don’t know about this," she bit her lip. "You try." I looked eagerly at the horse. To be honest I had waited a while to ride a horse. I had always been rather envious of Jessica’s weekly horse lessons. When I finally got the nerve to ask, my mom pulled her out because of the expenses. I stepped on the tree stump near by and lifted my leg over Arrow’s back. I felt a tingle go up my spine at Arrow’s first movement. I could tell the horse didn’t know what to do with it's self so it started running. I started slipping at the 5 second mark. 3 seconds later I was rolling in the dust. "Jessica, did you see me ride!?" "Yeah, that whole eight seconds was super impressive." Jessica said with her dripping in sarcasm. Personally, I didn’t care if Jessica hated or loved it, but those eight seconds would never be forgotten because I moving faster than an arrow and quicker than lightning. I will not be writing another part to this story, but I will be writing a new short story called, "Pure as Hope." Pure as Hope should be released onto this website very soon. I like it! Your writing is very vivid. It feels like it really happened to you, and I felt like I was there too. And I liked how realistic it was. If you had gotten on and rode for miles that wouldn't have felt realistic. Please let me know if this story is any good. If y'all like it, I will write more.